"2 weeks in Vietnam from the north at Hanoi and the bay, south through Hue, DaNang to Saigon and environs." 2 weeks in Vietnam from the north at Hanoi and the Ha Long Bay, south through Hue, DaNang to Saigon and environs, starting first with Bangkok. 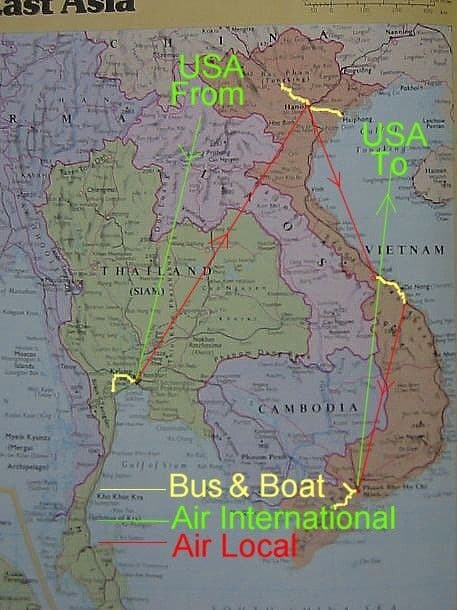 This map of Vietnam is marked to show our various travels by air, and by bus. The descriptions follow. Click on the button to start with the Table of Contents.